Twin Cities Wine Education presents a comprehensive evening learning about arguably the greatest country for wine in the world. When it comes to the world of wine, there is one country that stands head and shoulders above all in terms of history, reputation, and influence. That country, of course, is France. From the cool hills of Champagne in the north to the sun-scorched plains to the south, the sheer range of wines coming from France can be overwhelming to the wine novice. Add to that the Appellation d’Origine system (“AOC”) which names the wines based on geography with little or no indication of grape varieties, and it’s no wonder frustrations can run high in the French section of a wine shop. 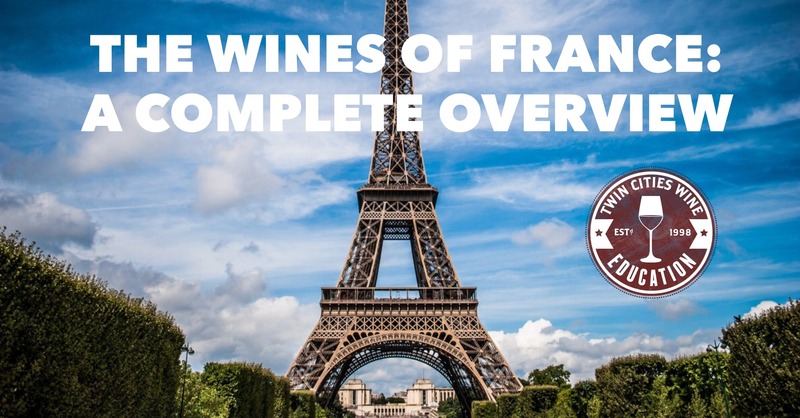 This class will not only demystify French wine for you but will reinforce why France is held up as the standard bearer when it comes to many of the best wines of the world. * An overview of all major wine regions: Champagne, Alsace, Burgundy, Beaujolais, Northern Rhone, Southern Rhone, Provence, Bordeaux, and the Loire Valley (including Muscadet, Saumur, Pouilly-Fume, and Sancerre). We will cover the permitted varieties, the geology, the topography, and buying advice to get the best bang for the buck. * An extensive discussion on the history of French wine, from the Roman times through World War II (and some particular stories from WWII that will amaze you). * Hints and tips to decipher the French wine labels, including a copy of Jason Kallsen’s “European Wine Decoder” to help you find the wines you are looking for. * A tasting of six great French wines from the regions discussed, presented in top quality Riedel stemware and with a discussion on each wine served. This is the best wine class available to learn more about, and become confident in, the wines of France! No matter where you are in your wine knowledge, this will help unlock the secrets to the greatest of all wine countries.